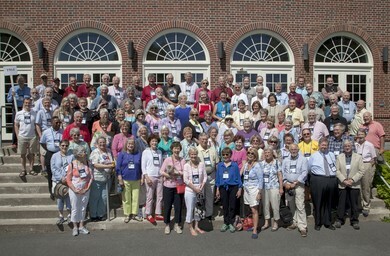 Here is our 50th Reunion Class Photo. If you attended Reunion you should recieve a copy of the photo no later than 12/7/14. If you do not, please contact me. Click HERE for an image that might be easier to see. The decision to close the Northfield campus and consolidate NMH to the Gill school grounds was announced just before our 40th Reunion. 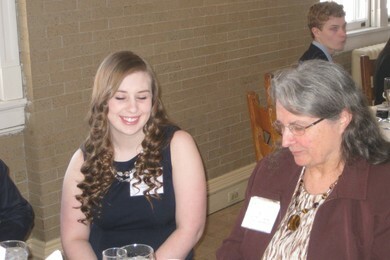 Alumnae deliberated how to keep the legacy of Northfield alive. The concept to commemorate the campus in a book was offered; the Trustees supported this endeavor and expanded the mission. Lift Thine Eyes, an illustrated history of the Northfield and Mount Hermon Schools including over 300 images, was published in October 2010. It celebrates both campuses, demonstrates the significance of place, and tells the story of D L Moody and his schools. The timeline begins prior to the purchase of the land and extends to the consolidation that left our school as coeducation without the five-mile hyphen. Four members of the Northfield and Mount Hermon classes of 1964 personally contributed to this book. Jim Ault scribed three chapters covering the years from World War I through consolidation on one campus. Bill Saunders captured the importance of the unique, natural setting of the campuses, the Northfield summer conferences, and Sacred Concert in our education. Gail Myers Pare and Sue Delaney McConchie served on the Advisory Committee and cochaired the Oral History Projects subcommittee. Thank you to these class members for preserving the historical evolution of Northfield Mount Hermon and rekindling our school memories/spirit. Lift Thine Eyes from Northfield Mount Hermon School on Vimeo. Our website offers 7 ways to reconnect with old friends! 1. Your Profile: You control your own profile. The questions you answer will appear on your personal profile; the questions you don't answer will not. Read the profiles of others and you can post a message on their profile * (viewable by all) or send a private email. (See #4 below) Please keep your profile up to date using the EDIT PROFILE link under "Member Functions". Keep your contact information up to date under EDIT CONTACT INFO. 5. Classmate Forums: A discussion forum where all registered class members can share memories, plans, ideas, comments. Subjects are arranged by topic. All registered members can view all of the posts in the Classmate Forums. You can edit or delete your posts at any time. You can choose to be notified by email when someone else posts in the threads you have posted in or have chosen to watch. 6. Profile Subscriptions: Keep up to date with old friends. Open Profile Subscriptions and you'll be able to check off their names. When someone on your list changes their profile, we'll email you a notice that a change was made. You'll also receive an email notification on their birthday. You can edit your list by reclicking on Profile Subscriptions. 7. Message Forum: This feature (scroll down) is an ongoing dialogue among class members. There are no items, topics, subtopics, etc. Share your greetings with the whole class, tell a funny story, or wish someone a Happy Birthday. Fair Warning: All registered class members can read every message. You can choose to be notified by email when someone has posted a response here. Get reconnected! - Don't be bashful! Click the "Post Response" button to add your entry to the forum. This is your site. If there is something you would like to see, let us know. If there is something you want us to change, let us know. We want this to be the place where you begin to Relive...Remember...Reconnect '64 To send a suggestion, just hit the "Contact Us" button on the left and send us an e-mail.